Today is St. Andrew’s Day. 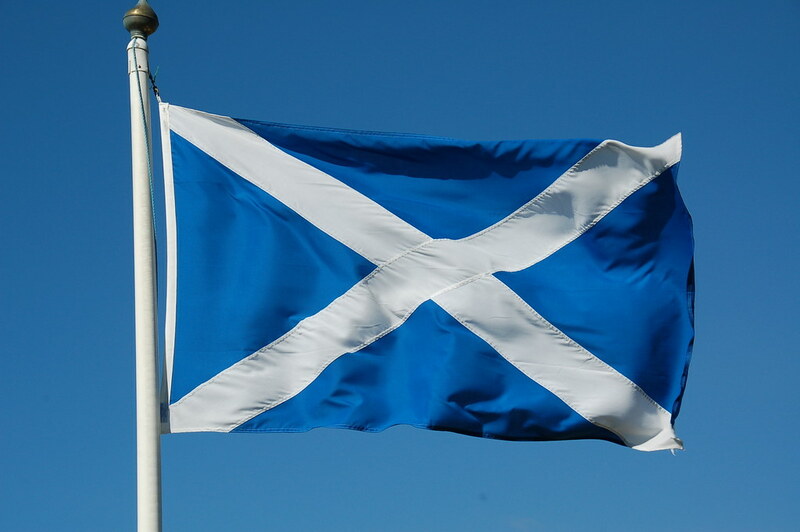 St. Andrew is the patron saint of Scotland, and his white cross appears against the blue background on Scotland’s flag. Despite being Scotland’s patron saint, he never actually went to Scotland in his life; his association with Scotland came much later in AD 832. Today, however, every 30th of November, Scottish people celebrate this day by showing their pride of being Scottish, wearing kilts, eating haggis and drinking whisky. Even though I’m not Scottish myself (I’m English), for the past year or so I’ve been fascinated with Scotland and its culture (especially their accent). This came out from my love of Nova Scotia in Canada, whose name means “New Scotland” in Latin and has the highest Scottish diaspora outside Scotland, so no wonder I love them both! So to celebrate Scotland’s birthday (at least that’s what I always thought it was), I decided to exhibit this specially-tailored gallery for the occasion, filled with drawings of my Scottish characters! (Nova Scotia sadly doesn’t count as it’s in Canada, not Scotland). To Scottish people in Scotland and all over the world (and those who wish they were Scottish, like me), Happy St. Andrew’s Day! The eleventh book exhibition on my blog! I might be going a little backwards in the year of 2007 for a little while, as many of the creative works I created in this year are all mixed up chronologically and I can’t exactly remember when I drew/wrote each one. Here’s a little comic book I created at the beginning of the year, starring the immediate predecessor of the Months as I know them now, the Month Boys. Much like the Danger November series of comics, this comic is inspired by the first comic in the Captain Underpants series of children’s books, charting the Month Boys’ “origins” and their first adventure they set off on, involving the trash from a cafeteria morphing into a green, ugly monster who can eat up everything in his path – even tables and chairs. Although August is the Month Boy (or technically, Girl) shown on the cover of the book, the actual story itself focuses on April. False advertising on my part? Syd is Hal’s 22-year-old son, born on the green island of Cape Breton. In sharp contrast to his unkempt, foul-mouthed and alcoholic father, Syd is more clean-shaven and polite, tending to stay off drink. Nevertheless, his father’s crude and vulgar behaviour is the bane of his life. Syd often wakes up in the morning to see that Hal has clambered messily into his bed, snoring noisily and breathing alcohol into his face. He hates it when Hal rubs his scratchy, stubbly cheeks against his, often complaining that he should get a good shave as soon as he can. Whenever he tries to relax after a hard day, Hal will inevitably come up and make his relaxation as stressful as possible, like loudly crunching on potato chips or breaking wind on him, sometimes angering Syd to the point that he has to go to bed early. Though on the surface it may seem like Syd is constantly putting Hal down and avoiding any kind of contact with him, despite his untidiness, vulgarity and alcoholism, Syd really does love and care for his father. He says that he wouldn’t have any other man as a father than Hal. Hal is a foul-mouthed, unkempt and drunkard man in either his late 30s or early 40s from the coastal Canadian province of Nova Scotia. His untidiness is made well evident in the ginger stubble on his chin, which often itches due to him being reluctant to wash or shave. Not a day goes by without him enjoying a good old drink – often drinking himself to unconsciousness. Hal often scratches his backside and picks his nose in public, and his love of eating rich food makes him belch and fart frequently. Because of both this and not washing often, he has a distinctive foul smell which can drive away anyone who is sensible enough not to go near him. Hal has a son, named Syd, who suffers with having to put up with his father’s drunken antics and poor hygiene. Syd MacIntosh, the 22-year-old son of Hal MacIntosh from The Hal MacIntosh Show.